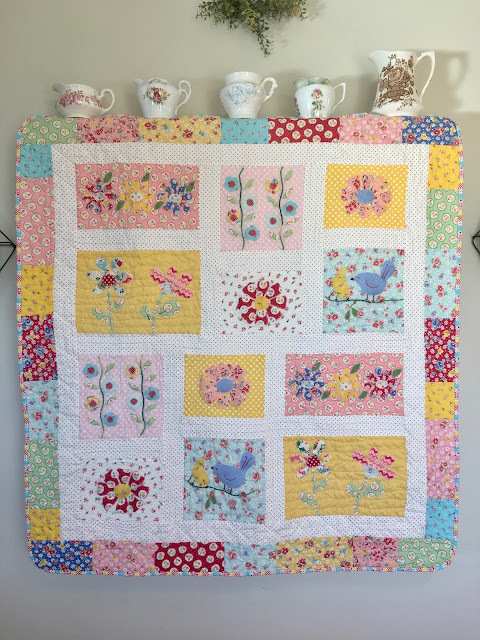 Sewn With Grace: Happy Flower Quilts Blog Hop and Giveaway! 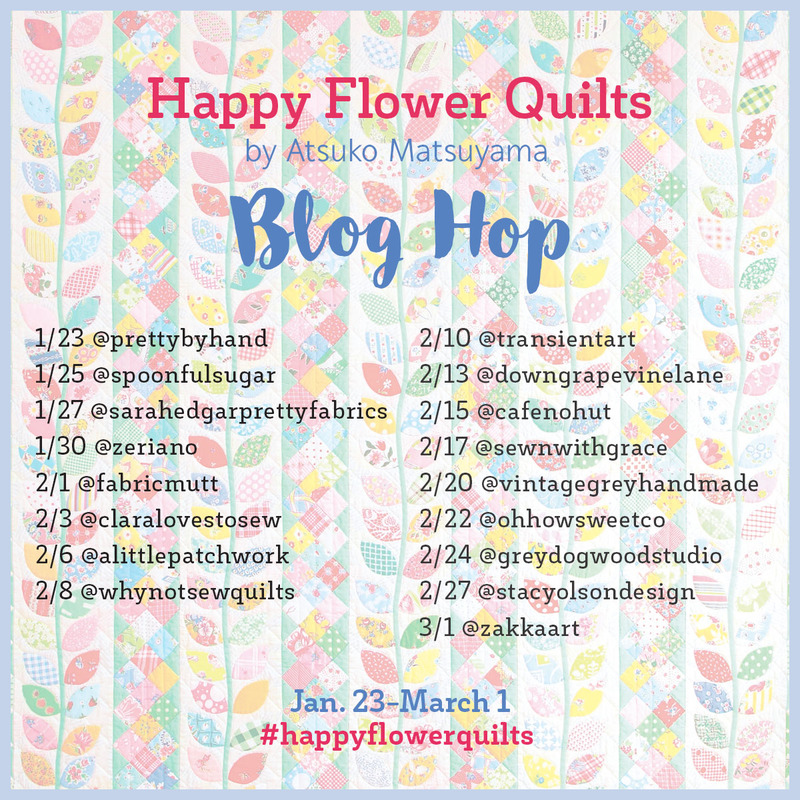 Happy Flower Quilts Blog Hop and Giveaway! Today is my stop on the Happy Flower Quilts blog hop hosted by Zakka Workshop celebrating one of the most anticipated books in the quilting world, "Happy Flower Quilts" by Atsuko Matsuyama. Many of us have had the Chinese translation for years and about flipped when we found out it was going to be published by Zakka Workshop in English. I have loved Atsuko Matsuyama's body of work for many years. 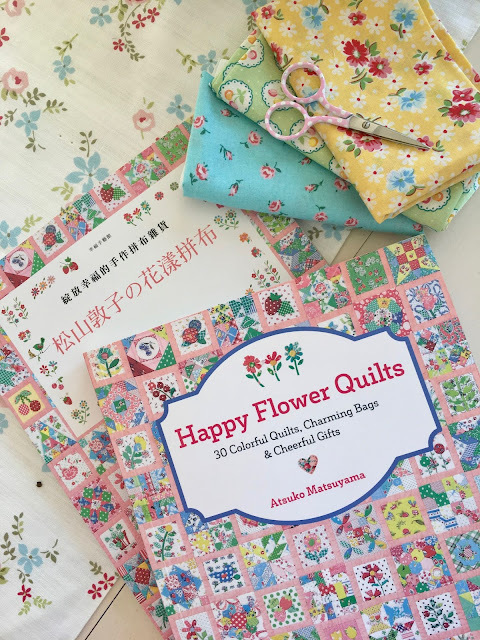 As a Japanese quilter and fabric designer, her fabric and designs have inspired my own sewing and quilting and made me want to be better at my craft. I was also thrilled to discover that one of my favorite bloggers and designers, Kristyne Czuperyk from Pretty By Hand, is one of the technical editors for the English edition. I had great fun making the "Flowers and Birds Baby Quilt". The fabric I chose is the soon to be released "Old New 30's Collection" and "Dots and Gingham" made and provided by Lecien Corporation. 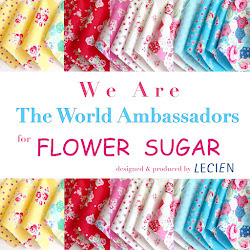 As a World Ambassador for Lecien I have the wonderful opportunity of working with many of their fabrics and this line did not disappoint, it is gorgeous and perfect for this project! The pattern incorporated both applique and embroidery. I used Lecien Cosmo embroidery floss. The book was an absolute joy to work with! The instructions are clear with detailed photos and good explanations of the techniques used for each project. Pattern sheets are provided for all of the various projects which include quilts, bags, pouches, pin cushions, sewing kits and more. 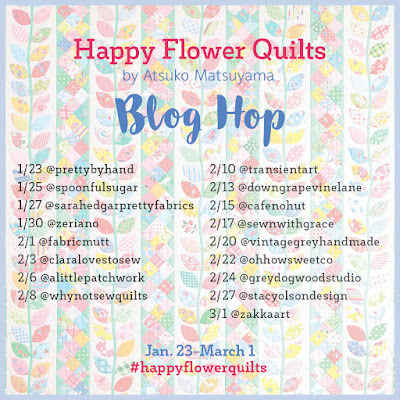 Zakka Workshop is generously giving away a copy of Happy Flower Quilts by Atsuko Matsuyama, at each stop on the blog tour. The giveaway is open world wide. To enter leave a comment on this post and a winner will be chosen on the last day of the blog hop, Wednesday, March 1. Please visit the other blogs and IG for awesome projects and lots of eye candy! 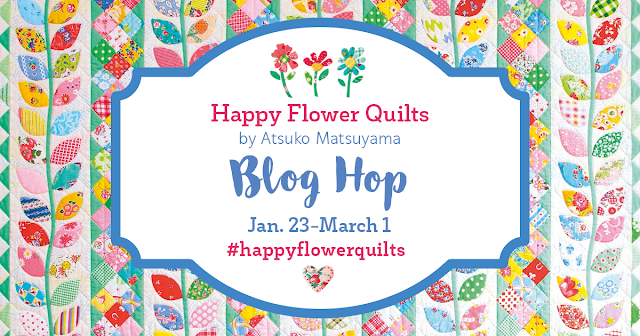 After the blog hop there will be a Quilt Along on Instagram (#happyflowerqal) featuring the Happy Flower Quilt Sampler, featured on the book cover. The quilt along will be hosted by Kristyne (@prettybyhand), Wynn (@zakkaart), and Melissa (@ohhowsweetco). It will kick off on March 6th. We hope you join in on the fun! Your quilt is absolutely delightful! I love every little detail. Thanks for sharing this! 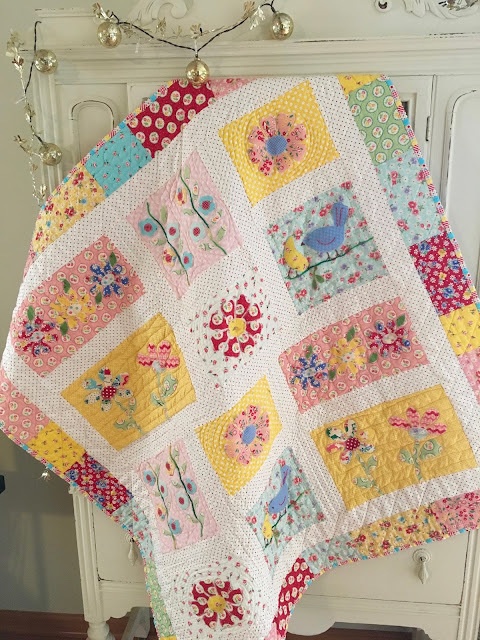 Love your baby quilt. This book seems to be full of dainty little girly things. I would love to win it for my library. Sherry at Phazoncontrols dot com. So gorgeous! I especially like the little birds! Thanks for being a part of the blog hop Renee! 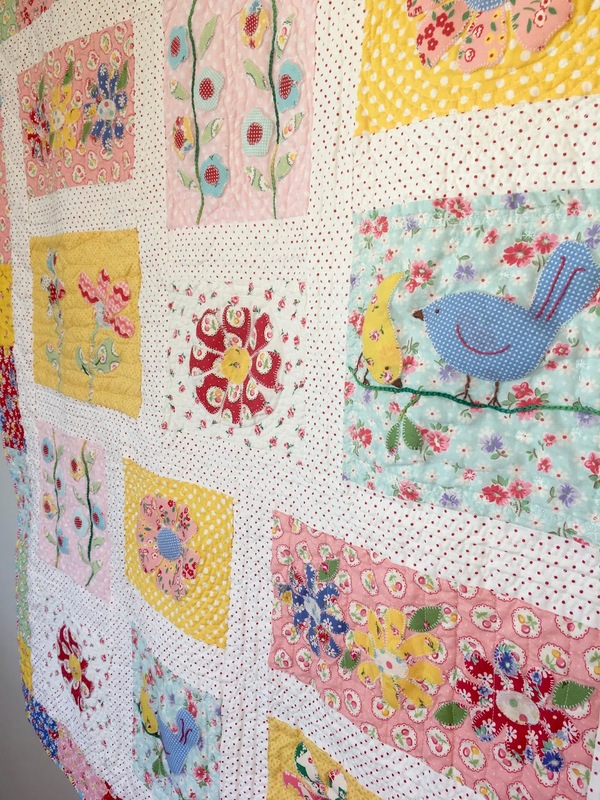 I love the fabrics you used...such a fun and happy quilt. 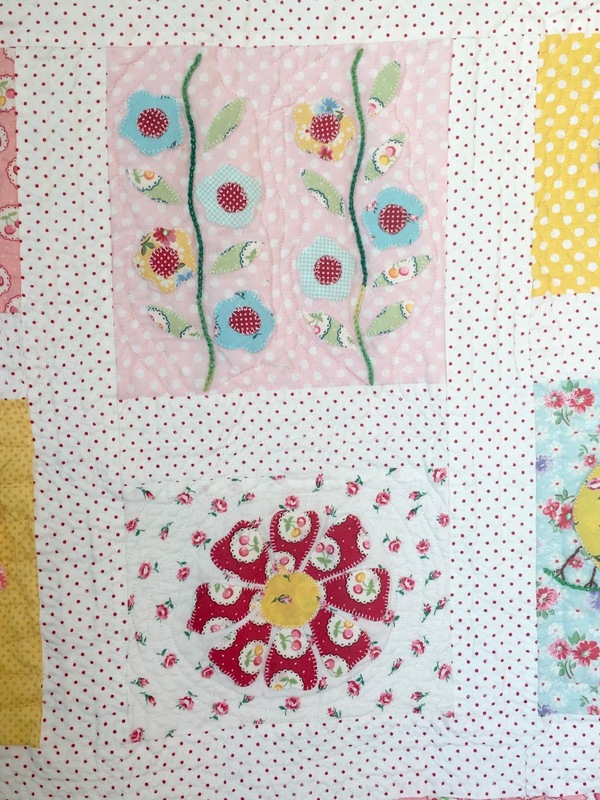 Love the fabrics in your beautiful quilt! I'd like to have this book in my library. Thank you for the great giveaway. SUCH A NEAT PROJECT>LOVE IT! THANKS FOR SHARING! Just looking at the fabric and photos make me happy! What a cheerful quilt. Thank you for sharing. I love the fabrics you used in your quilt. They're so bright and fun. I can't wait to see the book. So charming, Renee! I love it! I appreciate you telling us thatthe directions are clear. I was so happy to see this book come out in English and have it in my wish list on Amazon. The cover quilt is just beautiful! Can't wait for those new fabric lines too. Lecien is a favorite of mine! What a beautiful quilt! Thanks for sharing a chance at the great giveaway too. I love your quilt, such a happy pattern and beautiful fabrics and this book looks fabulous. 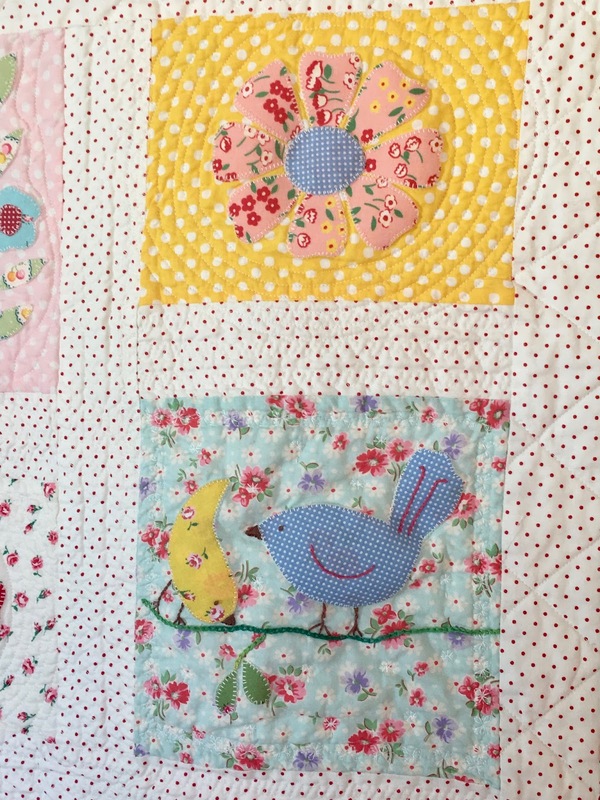 The bird square is adorable--well so are the flower blocks too! Thanks for a chance to win this wonderful book! Your quilt turned out pretty. I love the pattern you picked. What a cute little quilt. Love the fabrics. What a sweet quilt and I love the fabrics you used! The quilt is so sweet. I would love to have a copy of this book. Just found the hop! Your quilt is beautiful! wonderful book. I have been wanting to make my mother a floral summer quilt and this book has lots of wonderful ideas. Thanks for the giveaway. Your quilt is beautiful. Love the bird blocks. Great blog hop. Sweet quilt and gorgeous looking book. The cover alone, is to die for! Some of my favorite sewing is to make sweet gifts for friends and this book would be a great inspiration to me. Those little bird blocks are just adorable! Your quilt is so sweet. 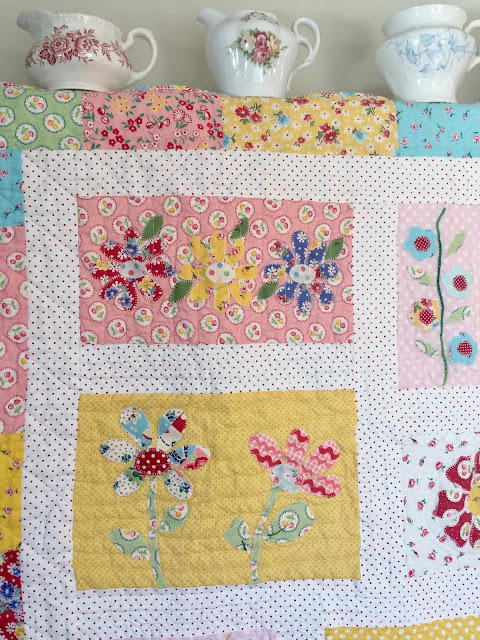 I love the colours and applique, they're a perfect choice for a baby quilt. Love the colorful and cheerful quilt. Gorgeous! I love your quilt! I love this book, so thank you for the giveaway. What a beautiful, happy quilt! I especially love the birds! Such a sweet quilt! Thank you! Your quilt is just so sunny. Love your quilt. Beautiful choice of color. Just lovely. 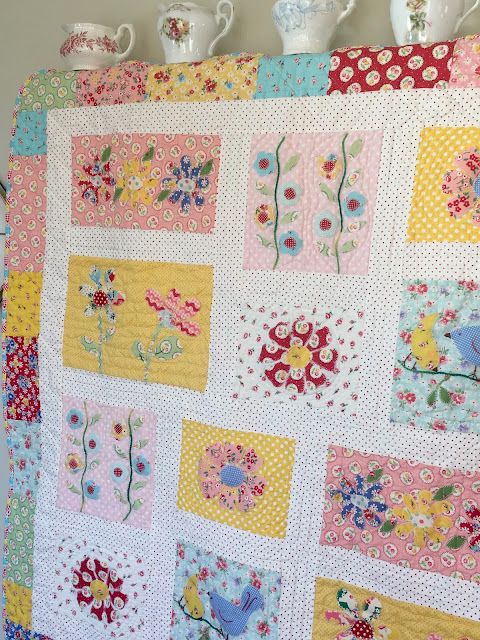 What a beautiful little quilt! Would love to win a copy of the book; thanks for the opportunity. Your quilt turned out so sweetly... it is delightful. I would love to win a copy of the book. Every project is tempting.